I remember watching the Disneyland TV show when I was a kid, hoping that this week's feature would be some animation from Fantasyland - "the happiest kingdom of them all". There were four of these magic kingdoms (though we never seemed to see much from Tomorrowland) and it was a toss-up as to what you'd get. The features that disappointed me most were the live-action Disney telemovies, often involving true-blue American families triumphing against the odds in the great outdoors. 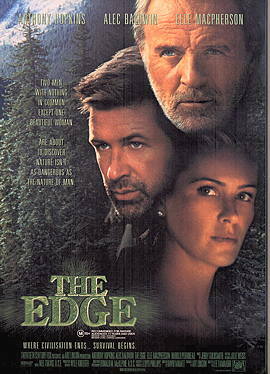 The Edge feels like one of those movies. Set in Alaska, it tells the story of lonely misanthropic billionaire Charles Morse (Anthony Hopkins) and his fight to survive after being stranded in the northern wilderness. His companions along the way are hotshot fashion photographer Robert Green (Alec Baldwin) and his assistant Stephen (Harold Perrineau), while Morse's lovely trophy wife Mickey (Elle Macpherson) waits back at the ranch. There's also a great big Kodiak bear which features prominently. What the director is shooting for here is a stirring tale of suspense, survival and personal discovery. Unfortunately though, it falls flat along the way. In true Hollywood fashion, certain characters are obviously doomed from the start; and once they're gone you never hear them mentioned again. Baldwin and Hopkins look tired in their roles, Hopkins giving his best "clueless" impressions since he played the butler in The Remains of the Day. The motivations of the main characters are formulaic and telegraphed to death and the dialogue is uninspiring. I was also disappointed to see so little of Perrineau, who played a stunning Mercutio in Romeo and Juliet. It's basically a very blokey movie in its themes and its action, and is something I suspect Hemingway would have enjoyed. For all the spectacular Alaskan scenery, however, it failed to move me. With its Hollywood formula and overly-familiar faces it was too safe; it needed a bit more daring to succeed. The Players: Anthony Hopkins, Alec Baldwin, Elle Macpherson, Harold Perrineau Jr.